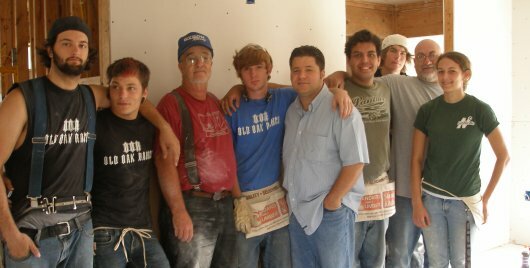 A great crew from California have been working hard hanging Mrs Gillum’s sheet rock. They plan to finish up this afternoon. btw, Mrs. Gilum celebrated her 79th birthday this week. She currently lives in a FEMA trailer scheduled for removal in December. She has no place to go, so we plan to work as hard as possible to finish up her house before then. Hundreds of people face the same predicament. Please prayerfully consider making a trip to Lakeshore. Even if you can only come for a weekend, we can use your help. 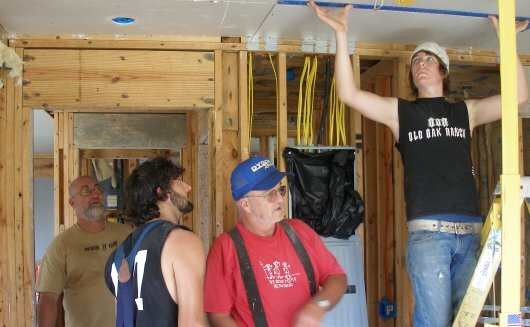 We especially need electricians, plumbers, and sheet rock finishers. We are proud to have been a small part in bringing this small group of young men to Lakeshore. They have such hearts to serve Jesus but they saw first hand that you have to walk out what your heart tells you. Thank you to Pastor Don, to James and the ladies in the store. You blessed us all so much. But especially thank you John and Mary Hershey for showing us first hand what being a servant is. We love you Lakeshore and we will be back!